This is the largest reform of procedural legislation since Ukraine's independence. 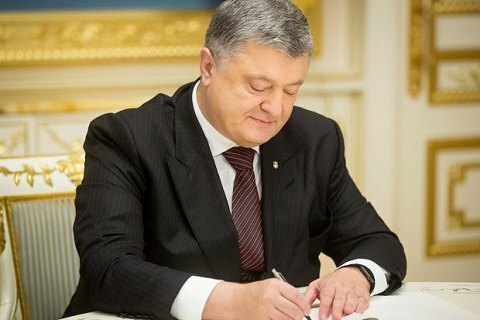 President Petro Poroshenko on Wednesday, November 22, signed a law amending the Economic Procedural Code, Civil Procedural Code and the Code of Administrative Proceedings, the press service of the head of state reported. This is the largest reform of procedural legislation since Ukraine's independence and the largest bill in the history of the Verkhovna Rada. The bill was drafted by the Judicial Reform Council taking into account the proposals of Ukrainian and international experts, and is designed to bring the Ukrainian judicial procedure in line with the best European and international practice. At the same time, some norms of the law stirred an ambiguous reaction. For example, the NABU stated concerns about the amendment of Article 219 of the Criminal Procedure Code of Ukraine, according to which the term of pre-trial investigation shall be counted from the moment it is registered with the Single Register, and that investigator will be obliged to close the case if the deadlines expire, even if the crime is not solved. The suspect cannot be indicted upon the expiration of the pre-trial investigation period. The bill regulates the work of the new Supreme Court as a single cassation instance, and the Supreme Court for Intellectual Property. The same law provides for the creation of a single judicial information and telecommunications system (electronic judicial proceedings). "Electronic Court" provides for the exchange of documents (sending and receiving documents) in electronic form between the courts, between the court and parties in a trial, between parties in a trial, and the participation of parties in a court trial in videoconference mode. Courts will be able to send court decisions, summonses, and other procedural documents parties in lawsuits at their official e-mail addresses. A single judicial information and telecommunications system shall starts functioning 90 days after the publication by the State Court Administration in the newspaper Holos Ukrainy and on the portal of the judiciary. Another novelty is the institution of order production in economic and civil legal proceedings to recover debts from individuals. A court may issue a court order to collect uncontested debts under written contracts that does not exceed 100 subsistence minimums for able-bodied persons (160,000 hryvnia).